Even though I'm a consummate laptop computer fan, I prefer to use an external keyboard and mouse whenever practical. The body-English associated with using a laptop's built-in keyboard and trackpad while cranking your head downward to see the display is terrible, and the ergonomic hazards of doing so for more than short periods of time are well established and documented. Accordingly, anyone who uses a notebook computer as their main work tool should have a good external keyboard and pointing device - and get that display up into the comfortable line of vision using a laptop stand. Aside from Apple's own freestanding keyboards and mice, a vast selection of third-party input devices are available, and Swiss-based Logitech makes some of the best, backed by a five-year warranty. Now here's the thing. 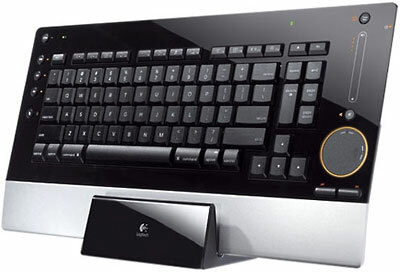 I really liked the Logitech diNovo Edge Mac Edition Cordless Keyboard that I reviewed here back in 2008, and which I think may well be the most aesthetically elegant keyboard ever made, with its glossy piano black surfaces and brushed aluminum accents. Being rechargeable is also cool, eliminating the hassle of messing about with batteries. 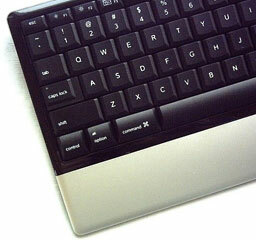 Logitech diNovo Edge Keyboard, Mac edition. The Edge is a Bluetooth wireless 'board, which means that you have to muck about with Bluetooth pairing to get it set up. For my purposes, the diNovo Edge's lack of a numeric keypad and its dispensing with the F13 through F15 keys was not compensated for by its inclusion of a built-in TouchDisc trackpad, touch-sensitive volume control, or any of the other multimedia controls and features it incorporates. I'm used to getting along without a numeric keypad and a full array of F-keys on my laptops, but I much prefer to have both, especially on a workstation keyboard. I especially miss the right-hand number keys when switching between OS X 10.5 Leopard Spaces, of which I keep nine configured, constantly switching among them, which requires a reach to the top of the key array with the diNovo Edge. Happily, Logitech addressed that preference (or necessity, for some folks who work with spreadsheets) by introducing the diNovo Keyboard, Mac Edition, which retains many of the virtues of the more expensive diNovo Edge - its high-gloss, semi-translucent Plexiglas frame, sharp angles, and thin profile (0.87" or 22.1 mm from base to key caps) - but with a standard keyboard layout and full numeric keypad and sans the touchpad and multimedia stuff. Well, near standard. The page keys are in a cluster at the top of the intermediate panel separating the main keyboard from the numeric pad, and there are a bonus 19 programmable F-Keys - something I don't recall ever seeing on another keyboard, plus (hooray!) a dedicated Eject key. I am a big fan of F-keys. The DiNovo Keyboard is wireless, but it uses the 2.4 GHz radio frequency, which I prefer over Bluetooth despite the fact that it requires a USB receiver dongle, which in this instance happens to be a longish one that protrudes about an inch-and-a-half from the USB port. 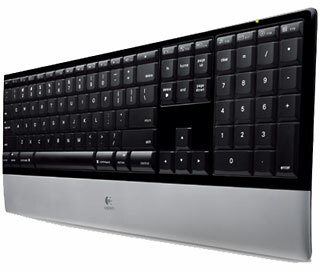 The cool thing is that Logitech managed to pack in a full complement (and then some) of standard-size keys in a board with a footprint barely wider and less deep than the diNovo Edge, while retaining the classy and Mac-complimentary piano black and brushed aluminum livery. This keyboard will make an excellent choice for use with one of the Unibody MacBooks on a desktop stand or with aluminum iMacs, since the black and brushed aluminum theme harmonizes especially nicely with those models. The diNovo Keyboard is also compact enough to pack what you in a medium-to-large sized computer case or backpack for use on the road. Another feature shared with the diNovo Edge is the PerfectStroke microscissors key switches, which are engineered to have a short, positive action with a slightly longer stroke than your typical laptop keyboard. Specifically, the PerfectStroke keys require 60 grams activation force and have a travel of 3.2mm (shorter than a typical desktop keyboard's 3.5mm to 4.0mm, but longer than your typical notebooks' - or Apple's aluminum 'boards - 2.0mm to 2.5mm). Of course, this Mac edition keyboard has standard Apple specific key labeling and positioning, with ambidextrous Command, Option, and Control keys located on the row flanking the Space Bar. The the navigation keys are in the ideal inverted-T configuration, with the only real anomaly (as noted) being the page keys' positioning to the upper right of the main keyboard array along with an fn key, where you might expect to find the Forward Delete key, and the Forward Delete key immediately beside it. Odd decision, but in general it's a mild departure from a standard layout that one gets used to quickly. There is no Power key to power up the system, but there is an on/off power switch for the keyboard itself located on the back edge of the housing and a small, green power indicator LED. Basic keyboard functions are supported by OS X without the Logitech Control Center drivers installed, but if you want to get the full functionality this 'board is capable of, such as programming the F-keys, you'll need to install the drivers, which are included on a bundled CD. Installation requires a restart of the Mac. The diNovo Keyboard is powered by four AAA cells, which Logitech claims offer battery life of up to three years (based on two million keystrokes per year). A flashing battery indicator light warns when battery resources are running low. In profile, the diNovo keyboard isn't quite as razor-thin as Apple's aluminum keyboard, but it's definitely low-profile. It has a bit of rake compared with the diNovo Edge's flat orientation. At a list price of $99.99, the diNovo Keyboard for Mac Edition is more expensive than Apple's aluminum keyboards, but substantially less so than the diNovo Edge's $179.99. The diNovo Keyboard Mac Edition is a deluxe keyboard alternative with excellent quality of workmanship, materials, finish, and thoughtful design. If those qualities are important to you, you'll probably find it worth the premium price. The diNovo Keyboard, Mac Edition can be used with any Mac computer, including the MacBook Air, iMac, MacBook, or MacBook Pro. Unfortunately, it appears that the Mac versions of these diNovo keyboards are no longer being manufactured by Logitech (the diNovo Edge for Windows continues in production), although they're still supported and still advertised by many resellers, usually at discounted prices. If you want one for your Mac, best move quickly.